I’ve been using this method since coming across it in John Seymour’s book (the organic gardening guru of the 1970’s) entitled the Self-sufficient Gardener, dated 1978 – how time flies when you’re enjoying your garden. This is how to do it. Knot together the ends of a 3 foot length of string (depending on how big a bunch you want to make) and hang the loop from a hook. 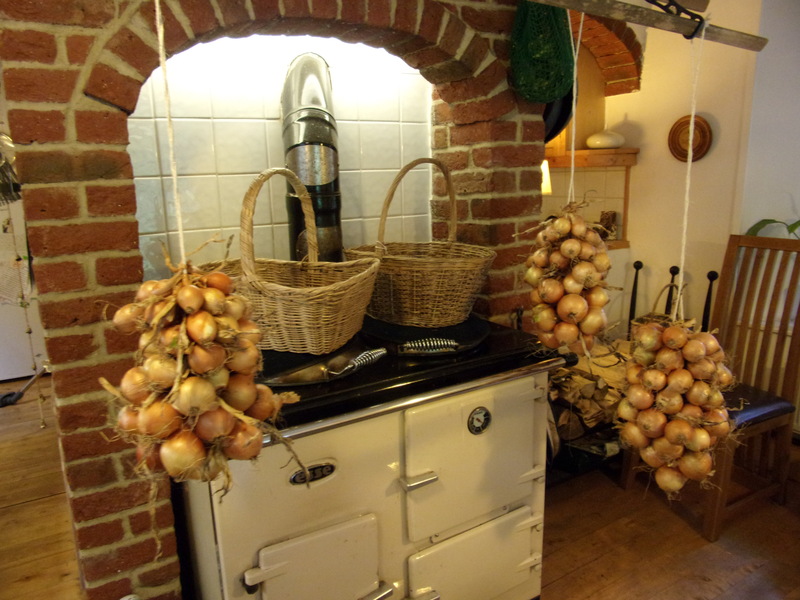 I find that the Sheila Maid clothes airer which is above our wood-burning cooker is perfect for this. Weave the dried stem of the first onion through the loop and then add the second onion, weaving it in and out of the string. 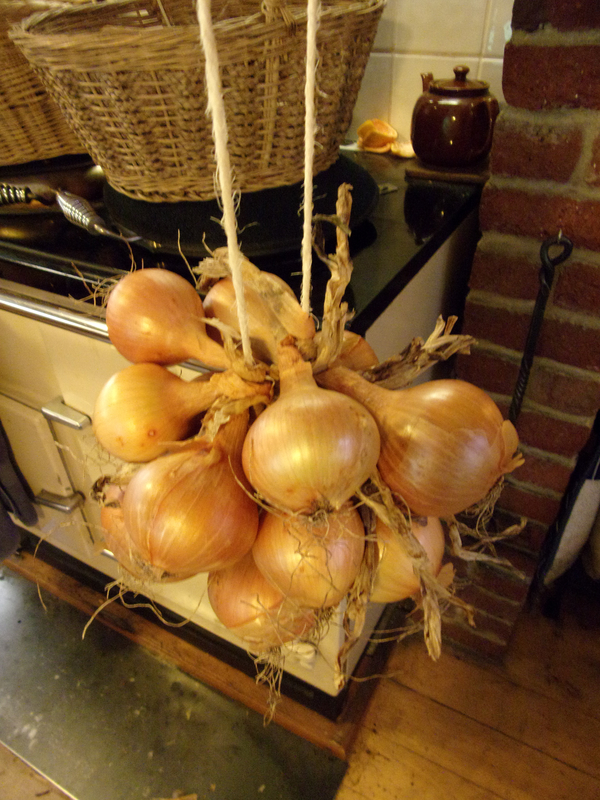 The weaving must be tight and the second onion should finally rest on the first. One by one add onions, weaving first to the left and then to the right. 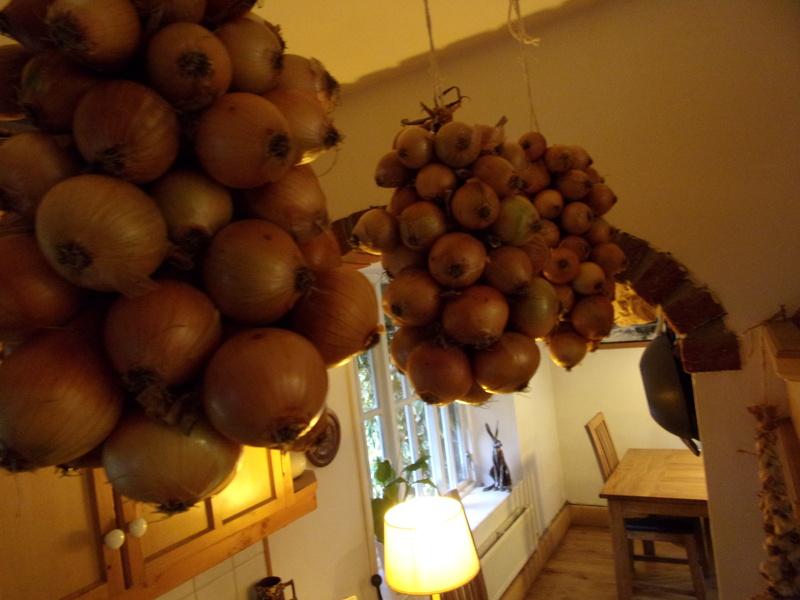 Strung in this way, and hang up in our kitchen, our onions usually last us through the winter. Needless to say, they must be thoroughly dried before stringing. Ours have been on the windowsills since they were harvested to ensure they were properly dry. They store best if they have a good couple of days baking in the sun after they have finished growing. It wasn’t that sort of summer this year. 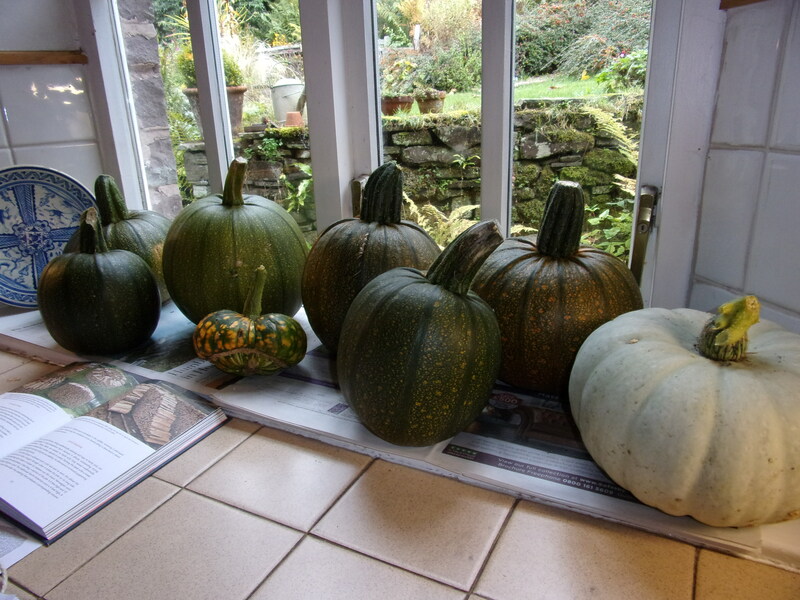 Now that the windowsills are onion-less and we’ve had the first light frosts, it’s time to harvest the pumpkins and squashes, so that they can finish ripening indoors. Just about plural – 6 pumpkins and 2 squashes. Varieties this year are Tom Fox – nearly always reliable even in a cool summer like this one – from seed saved in 2015. 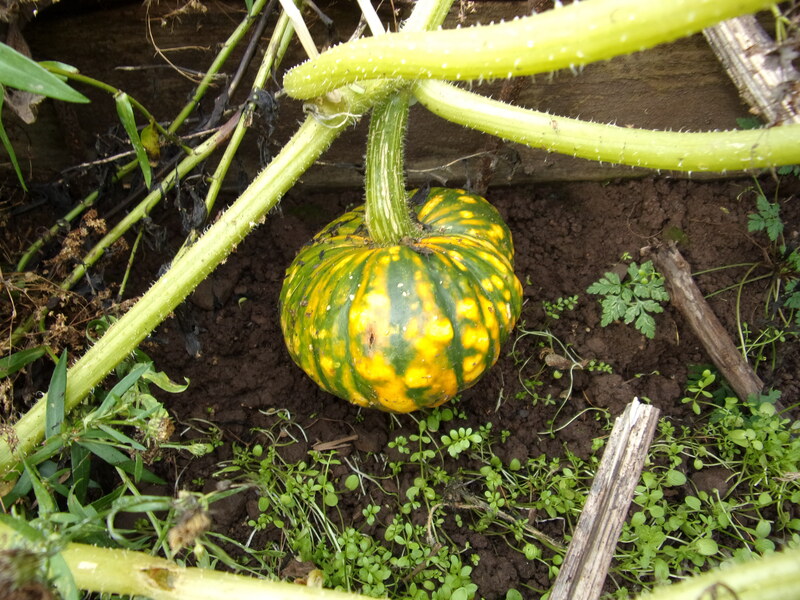 Squash Crown Prince – again from saved seed. 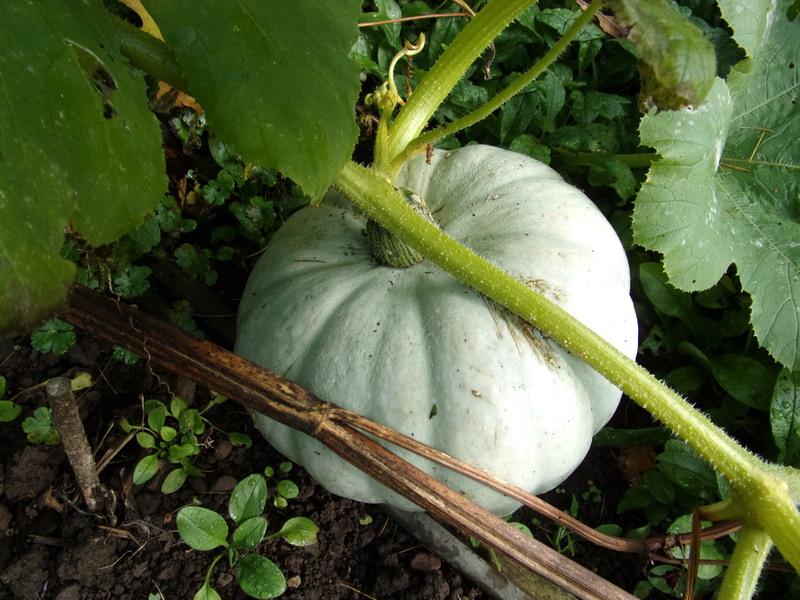 And squash Turk’s Turban which I haven’t grown before and was hiding under a leaf so I didn’t know it was there until we had a frost. We’ve already eaten this one in a lovely mixed root vegetable roast with lots of herbs and fennel and cumin seed. 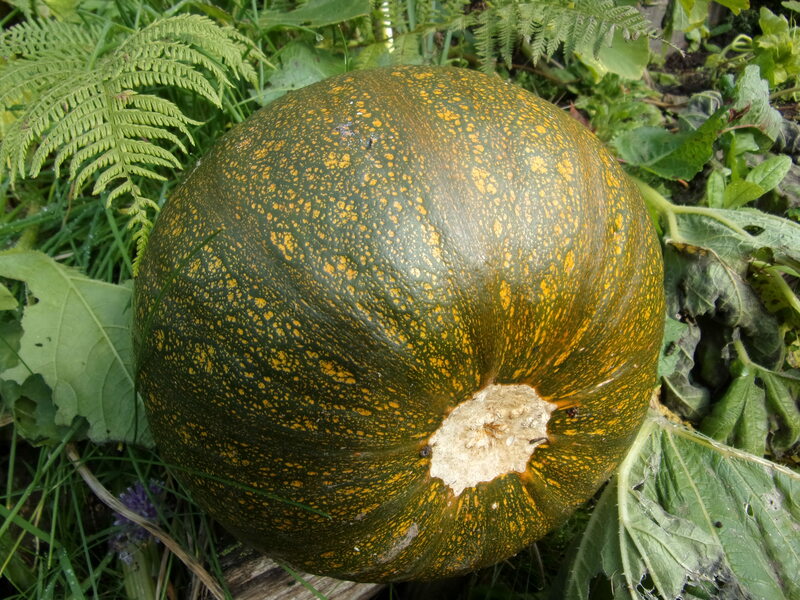 I find that pumpkins and squashes keep perfectly well on a windowsill – just need to keep an eye on them and as soon as they show signs of going soft then they need to be made into delicious pumpkin soup and/or chunked up and put in the freezer. 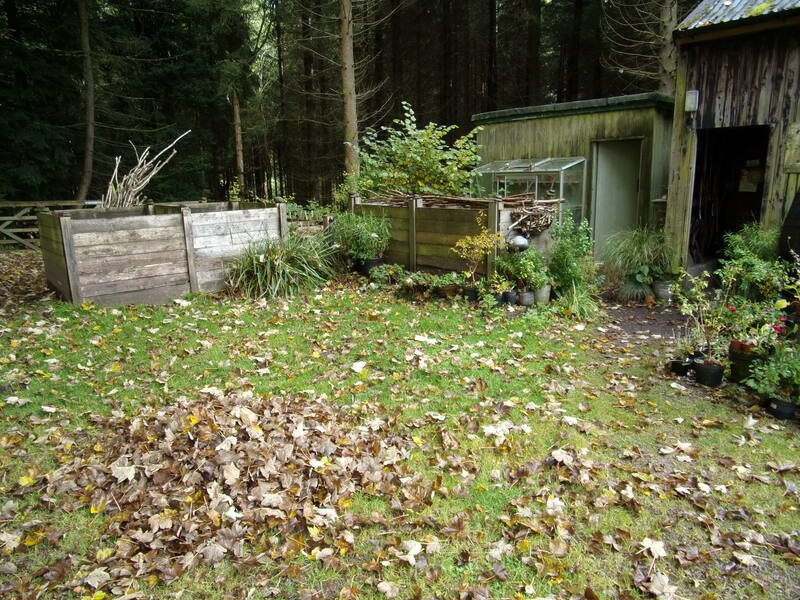 Other seasonal tasks have included raking up autumn leaves to make gorgeous friable leafmould to add to potting mixes or use as a mulch (despite dire warnings from Special Plants Nursery guru Derry Watkins). We have 2 sets of 2 leafmould bins in different parts of the garden. This year’s leaves won’t be used for at least a year. One set of bins takes mostly sycamore which breaks down quickly, whilst another takes beech and oak, which take longer. The leaves need air and weather so the bins are open and made of chicken mesh, whereas the compost bins shown here (which take weeds, lawn mowings, straw and muck from ducks and chickens, kitchen waste such as outside leaves of cabbages, carrot tops etc – but nothing cooked – are wooden and always covered. 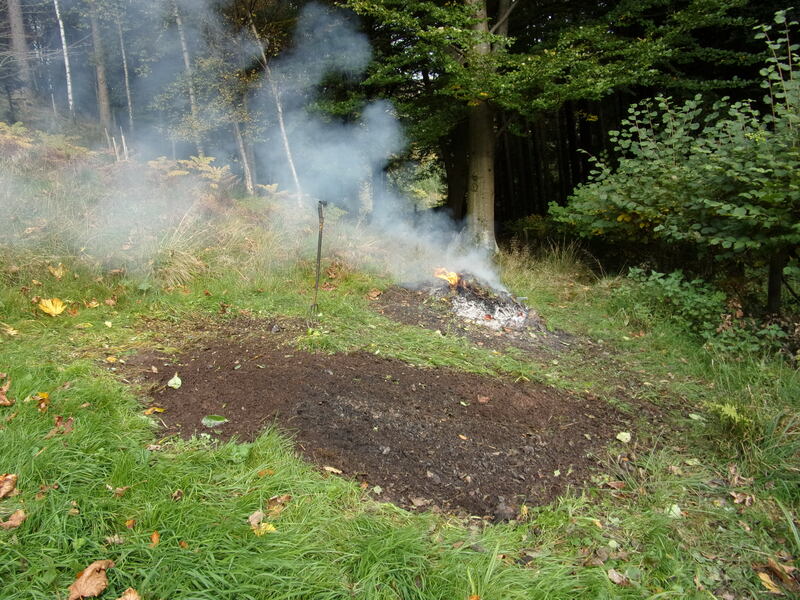 But I have also had a bonfire – there are some things you don’t want in your compost heap. We all know that it’s important to move the material from where it’s been sitting awaiting the right time to burn it, to another place. The photo above shows bare soil in the foreground where the material had been moved from. I disturbed a frog and a slowworm which I moved elsewhere, where they can happily feast on our multitude of slugs. 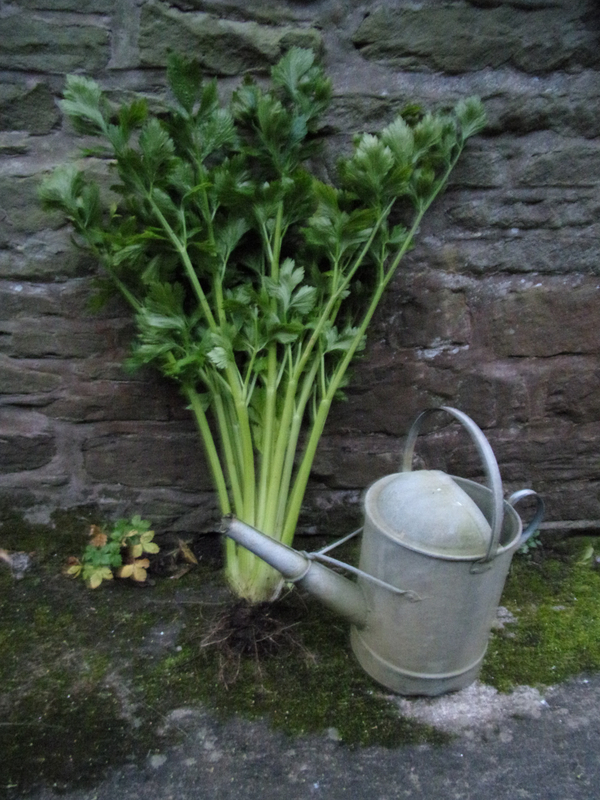 Started harvesting the celery. Terrific crop this year – probably because I spent all summer carrying cans of water to it from our extensive rain-water harvesting system. Even though the summer has been cool we’ve had very little rain for months and celery, and celeriac, really prefer to have their feet wet. 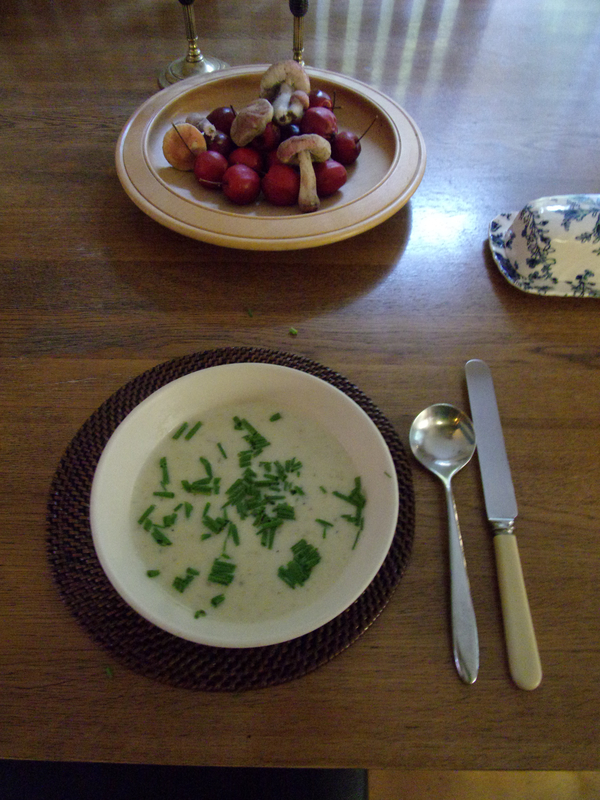 Makes lovely celery soup. Yum. 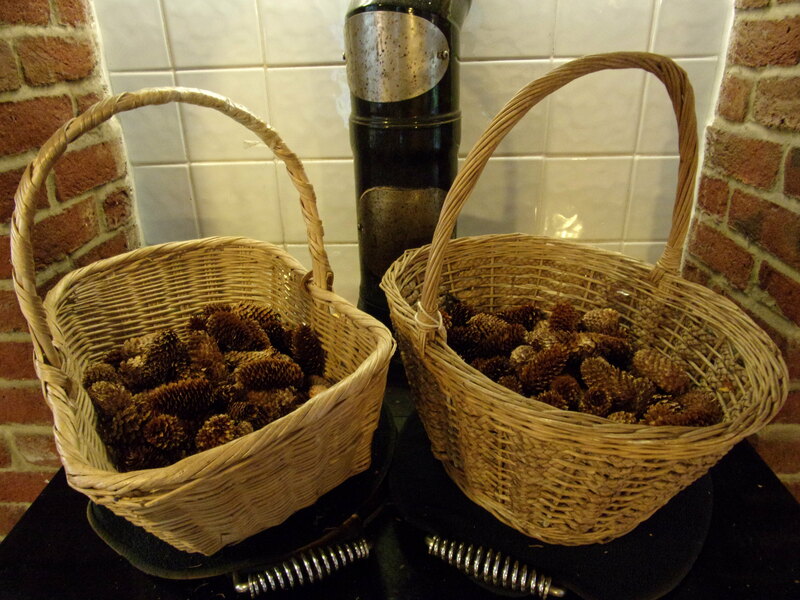 Thinking ahead to Christmas, I have been collecting and drying cones for use in Christmas holly wreaths. 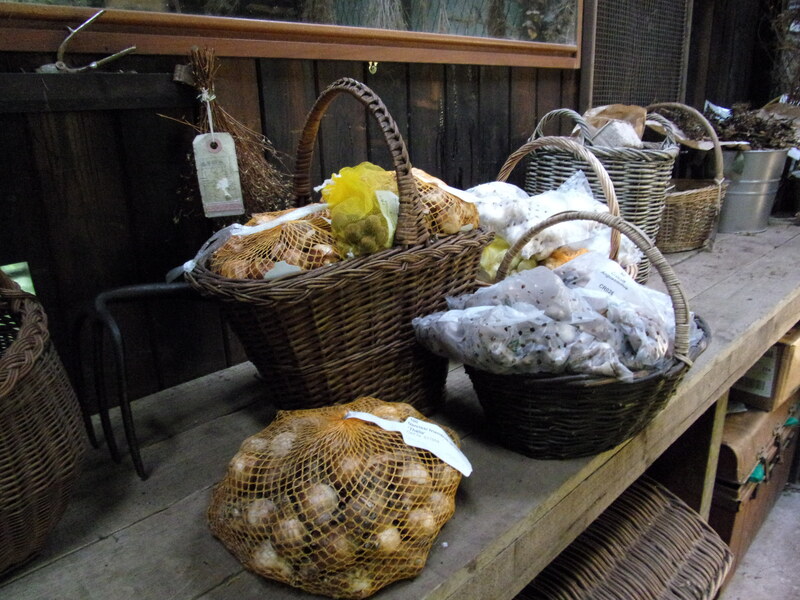 And then there’s planting Spring bulbs. We are about half way through. Planting lots in pots this year because we appear to have a resident badger which visits nightly and likes eating them.